Well done to the sixth year pupils who participated in this year’s Business Dynamics event at the Myrtle Bank Hotel. Many thanks to all of the session leaders who contributed and a very big thanks to Sheena Matheson of Business Dynamics for putting together another superb two days for us at Gairloch High School. Click on the photo above for more pictures or visit our Enterprise pages on the school website. S5/6 Prelims – These exams are now complete. Thanks to Chief Invigilator, Dr. Griggs, for her smooth running of the event in the Community Hall. Staff have now marked exam scripts and reports will be issued to parents soon. During the Easter holiday staff will offer the annual Study Club. Three days of revision available to all S4, S5 and S6 pupils wishing to prepare for their finals. S2 Parent Course Choice meeting – Parents of S2 met with the Senior Management Team and Pupil Support staff on the 9th February to discuss the options available to their sons and daughters as they prepare to choose Standard Grade and National Qualifications for study during S3 and S4. Personal & Social Health Education – 28th January – As part of our concern about the misuse of alcohol by youth in the community we invited Viv Caird from the Alcohol Counselling Service to discuss the issues with S4 pupils. Our feedback indicates that this was a worthwhile event and the school (with the support of the Parent Council) plans to develop this work with the help of other groups working in Ross-shire. Rural Skills – Mr. Milner and the S2 pupils are making good progress building raised beds at the back of the school. They recently collected seaweed off the beach to use as fertilizer and liquid feed. Gairloch Estates have also graciously allowed us to develop a small section of land behind the school as part of our rural skills project. All S2 pupils are involved in this project as part of the John Muir Award – Discovery level. Having explored the school environment, they decided to build the raised beds. Thanks to Derek from William Gray Construction for donating the timber, topsoil and gravel and also to Willie Mac for the trailer load of muck. The beds are now ready for planting. If anyone has a small shed they no longer need, S2 pupils need somewhere to store our tools. We will be happy to pick it up! Climbing Wall Upgrade – There will be an AGM of the Community Climbing Wall Committee in the High School at 7pm on Tuesday 23rd February. Anyone who is interested in hearing the plans for the wall is welcome to attend and contribute. Practice-a-Thon – A reminder that, during this term, pupils, staff and members of the community are involved in the Clic Sargent “Practice-a-thon”. By agreeing to practice every day for a fortnight, participants are gathering sponsors in order to raise money for Clic Sargent and for musical instruments. If anyone else would like to take part (perhaps practise on an instrument gathering dust somewhere in the house…), please collect a sponsor form from the school office. Otherwise, please be generous in your sponsorship of others. Thank you. Cross Country – Congratulations to the pupils who represented the school in the annual Ross-Shire School Sports Association’s Cross-Country Championships at Alness last week. Competition was intense with 250 runners participating in the six events. The Gairloch runners produced some very creditable performances, topped by a 5th place in the 1st year boys race for Louis Stein and a 5th place in the under-15 girls race for Josie Ogle. Well done to both of them! The results and photos are available by clicking here. Dr Shearer and Mr. Bowker reported that the competition was tough. Our pupils were up against some very fast runners and so their results are a credit to them. A fair number of the runners entering the competition train for these events and that is reflected in their performance and results! Their Past – Your Future Exhibition in Inverness – We reported previously that Ceitidh Hulme, Yarima Conway, Ciaran Alexander, Ann MacLean, Callum Street and Ainslie Mackenzie were involved in this national history project. The project involved pupils speaking to older generations who remember the Second World War. The resulting exhibition is now at Inverness Museum and Art Gallery and runs from the 20th February until 19th March. Well worth a visit! IT’S THAT TIME AGAIN – S1 are on the loose! Grand Annual Fundraiser for Nethybridge and selected charities. Thanks to our janitor, Andy Bowker, for all the work he did around the school, library and leisure to assist safe passage for pedestrians during the recent bad weather. As ice came off the roof a significant amount of damage was caused to our gutters. Andy has repaired these. The damage to the shed may prove a larger task. We have also had roofers over to repair tiles higher up on the building. Futurechef – As everyone should know by now, Rosie Smith, S4 won the Regional Final of this competition on the 26th January in Inverness. She will now travel to London in March to take part in the National Final against 11 other regional finalists. Well done Rosie – we have high hopes for you in London! Young Quality Scot Award – Roxanne Ramsay was nominated by the school this year as a worthy recipient of the YQScot Award. 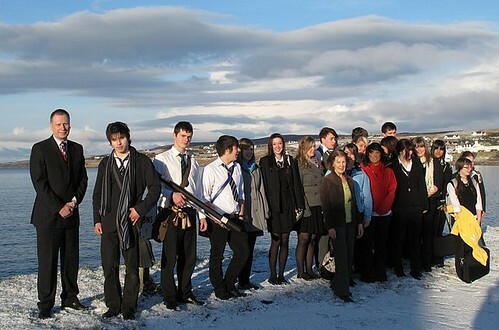 The 2010 Awards offers access to a leadership training event to be held on the 11th and 12th Feb. 2010 at Badaguish near Aviemore, prior to a national presentation on the 11th & 12th March, which is being hosted by North Ayrshire Council in Irvine. Roxanne is involved in working to the benefit of others through school, church & Highland Youth Voice. She has done a power of work quietly and efficiently and this is just recognition of her efforts. The school has successfully nominated pupils for three years in a row now. The Highland Council has previously awarded pupils Becky Massey and Meghann Richardson for their work. Well-done Roxanne! Maths Challenge – Sonny Spencer S6, has been awarded a Silver Certificate in the UK Mathematical Challenge 2009 and has achieved Best in School for the senior category. Project Trust – Amy French has raised the £4850 required by the Trust. This is quite an achievement and while Amy has worked hard to achieve this it reflects well on a generous community. Thanks to each one of you who continually support our young folk. We would welcome any or all of the following donations: baking, books, DVDs & CDs, bric-a-brac, plants, electrical items in good working order, toys, clothes in good condition, jewellery, bottles and raffle prizes. IT’S THAT TIME AGAIN – S1 will be on the loose shortly! Grand Annual Fundraiser for Nethybridge and selected charities. Thank you for supporting the school! Practice-a-thon – Musical pupils plan on taking part in a Practice-a-thon for Clic Sargent Cancer fund for children. For 2 weeks, pupils will agree to practise their instruments every day for perhaps 10-15 minutes. They will be looking for sponsors in the community for this worthwhile endeavour, which has the added bonus of making them play better as a result of all this regular practice! However, members of the community who play or sing can also take part. Any 2 weeks between now and the end of March can be chosen, and instructions on what to do can be found on the sponsor form, which can be collected from the school office. Miss Hunter and other members of staff are going to participate, so please feel free to join them by dusting down neglected accordions, guitars, keyboards or tonsils! Musical Instruments – We are looking for musical instruments! If you have any that you would like to see put to good use and you would be willing to donate them for use by the school please drop them in or contact the school (712275) and we can collect. Fèis Rois – The school has had a positive response from Fèis Rois manager Fiona Dalgety and negotiations are underway to supply after-school classes for upper Primary and Secondary pupils in the near future. It is also hoped to run at least two weekend events in the school between now and the summer. Details will be provided as they become available. RAF Visit – On Thursday 28th January, the S1 pupils had a visit from Andy and Mark of the RAF Motivational Outreach Team. They spent the afternoon engaged in team building activities. The pupils are now in the initial stages of planning for their residential trip to Nethybridge in May. The RAF instructors were helping them to co-operate with one another to solve practical problems quickly and efficiently – skills that they will be continuing to develop in the coming months. They worked together in games of ‘Moonball’, ‘Magic Stepping Stones’ and ‘Ever Decreasing Circles’. The afternoon concluded with a race between S1A and S1B. Each class had to get themselves all through a car tyre inner tube as quickly as possible. They were given 5 minutes to plan their strategy and practise and then it was competition time. Employing very different techniques, S1B were victorious with the inevitable press-ups for S1A! During the afternoon, the pupils were encouraged to think about different ways to communicate with each other and it just goes to prove that in any team, each individual has their strengths. They had a lot of fun along the way too. Click here to see some photos of S1 taking part. Wind Turbine – The proposed wind turbine for the school has successfully passed the planning stage. The turbine will be placed at the edge of our playing fields. A typical annual output from the size of turbine that has been approved (15kW on a 15metre mast) is 37,820kWh. This would produce 6.5% of our annual electricity. This would save £3800 annually at current prices and give a payback period of just over 6 years. Solar Panels were considered and we received the following advice. There are 2 types of panels, PV panels generate electricity and Solar Thermal generate heat. Both generate most over the summer months when there is little demand. PV are very cost prohibitive and in this part of the world turbines are much more productive per pound of installation cost. Solar thermal are a bit better in capturing energy to heat water even on cloudy winter days. In Gairloch High they would only be heating hand-washing water and showers. As a result solar panels would not be cost effective.